The updated new edition of the classic and comprehensive guide to the history of mathematics For more than forty years, A History of Mathematics has been the reference of choice for those looking to learn about the fascinating history of humankind s relationship with numbers, shapes, and patterns. This revised edition features up-to-date coverage of topics such as Fermat s Last Theorem and the Poincare Conjecture, in addition to recent advances in areas such as finite group theory and computer-aided proofs. 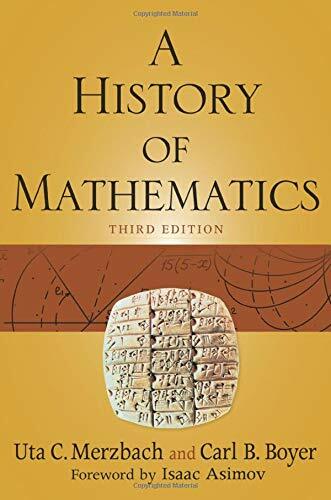 * Distills thousands of years of mathematics into a single, approachable volume * Covers mathematical discoveries, concepts, and thinkers, from Ancient Egypt to the present * Includes up-to-date references and an extensive chronological table of mathematical and general historical developments. Whether you're interested in the age of Plato and Aristotle or Poincare and Hilbert, whether you want to know more about the Pythagorean theorem or the golden mean, A History of Mathematics is an essential reference that will help you explore the incredible history of mathematics and the men and women who created it. "the book is an essential reference that will help you explore the incredible history of mathematics and the men and women who created it." (Zentralblatt MATH 2016) the book is an essential reference that will help you explore the incredible history of mathematics and the men and women who created it. "Boyer and Merzbach distill thousands of years of mathematics into this fascinating chronicle. From the Greeks to Gödel, the mathematics is brilliant; the cast of characters is distinguished; the ebb and flow of ideas is everywhere evident. ... Without doubt, this is--and will long remain--a classic one- volume history of mathematics and mathematicians who create it." "Both readable and scholarly ... a fine introduction to the topic." "When we read a book like A History of Mathematics, we get the picture of a mounting structure, ever taller and broader and more beautiful and magnificent and with a foundation, moreover, that is as untainted and as functional now as it was when Thales worked out the first geometrical theorems nearly twenty-six centuries ago." For more than forty years, A History of Mathematics has been the reference of choice for those looking to learn about the fascinating history of humankind's relationship with numbers, shapes, and patterns. This revised edition features up-to-date coverage of topics such as Fermat's Last Theorem and the Poincaré conjecture, in addition to recent advances in areas such as finite group theory and computer-aided proofs. Boyer, Carl B.; Merzbach, Uta C.